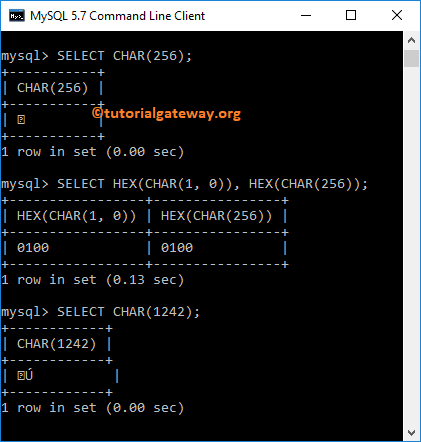 MySQL CHAR is one of the String Function, which is used to convert the series of user specified integer values (ASCII values) to a character string. 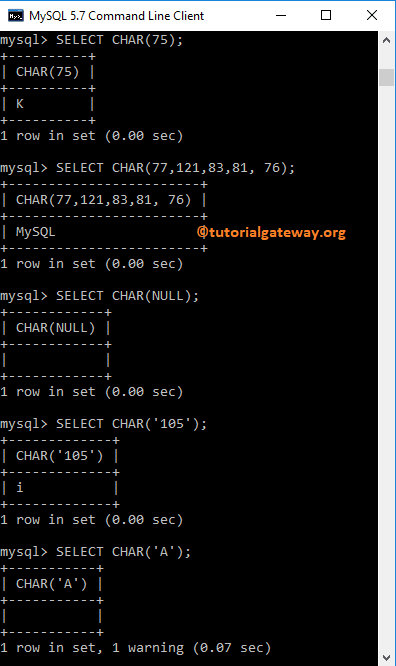 In this article we will show you, How to use this string CHAR in MySQL with example. TIP: Please refer ASCII Table to check the ASCII values for each and every character. The CHAR Function in MySQL is used to convert the integer values into characters using the ASCII Table. The following query will show multiple ways to use this function by passing different values. If you pass the integer value (argument value) larger than 255 (maximum allowed char) then the MySQL CHAR Function will convert the number into multiple bytes. For example, CHAR(256) is equal to CHAR(1, 0). The following query will show you the same with different values.